The SLM Series servo motor by Exlar offers brushless servo motor technology with the highest torque to size ratio available. The SLM Series is available in frame sizes of 60, 90, 115, and 142 mm. The SLM Series is UL recognized, available in 115 VAC, 230 VAC, or 460 VAC, with speeds up to 5000 RPM. 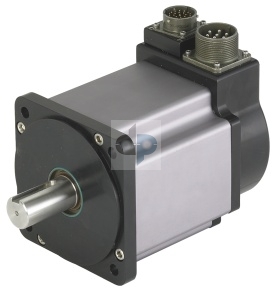 The SLM features an oversized output shaft, IP65 sealing, and a brake is an available option. Feedback configurations are available for most servo amplifiers. In addition to the standards configurations, Exlar offers the SLM Series for custom OEM applications. GGG = Feedback Type (also specify the amplifier/drive type model being used when ordering) - Standard incremental encoder - 2048 line with commutation, 5vdc. - Standard resolver - Size 15 resolver. XX1 = Wiring and feedback device information must be provided and new feedback callout will be created. 001 = Feedback Mount .375 inch shaft ready for size 15 resolver or encoder. 002 = Feedback Mount 8 mm shaft ready for feedback device. Allen-Bradley/Rockwell: Actuators used with Kinetix and/or Sercos based control systems require a 3rd party motion database purchased from AB/Rockwell. Please contact your AB/Rockwell representative for support. Optional 5 digit assigned part number to designate unique model number for specials. 1. These housing options would typically be accompanied by the choice of the electroless nickel connectors if a connectorized unit were selected. This choice may also indicate a need for special material main rods or flanges. Please inquire with Exlar engineering. 2. Available as described in Feedback types. 3. Stator voltage and pole options allow for catalog rated performance at varying amplifier bus voltages and pole configuration requirements. 4. When selecting special housing options, use "G" in this model mask location.